openSUSE releases are transparently built in the openSUSE:Factory project, including automatic image creation. Users can find the latest software packages for their distribution. A good availability for everyone is achieved through mirrors around the globe. Automatic resolving of dependencies to other packages. If a package depends on another package, this package will be triggered for a rebuild automatically if the depending package changes. Linking to other projects: Patches can be tested against current packages from other projects. Open interfaces allow different clients and external services (e.g. 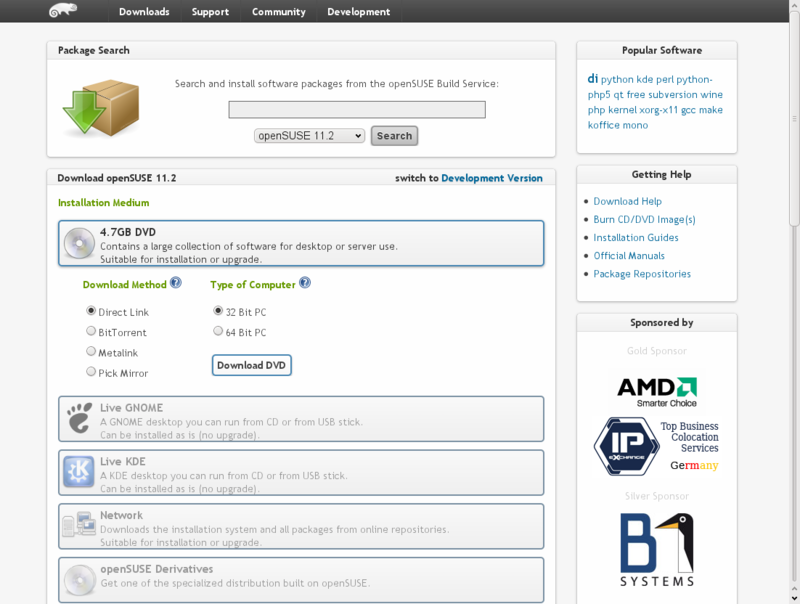 SourceForge, kde-apps.org) to interface with the Open Build Service and to use its resources. For developers it is an efficient place to build up groups and work together through its project model. No "compiler farms" of different hardware needed to build packages for different architectures and multiple Linux distributions like Fedora, Debian, Ubuntu, and more. KIWI integration for automatic product and image creation. The Open Build Service is licensed under GPL and can be installed on any piece of hardware that does have at least 2GB memory. The easiest way to run your own instance is to use the OBS appliances. The appliances can be used to run an instance directly or to install an instance on your server. A manual installation is also possible but is more complicated. The tutorial can guide you through it. Besides the openSUSE project, a number of Open Source projects like the Moblin/Maemo/MeeGo project, VideoLAN project, companies like Dell, Cray, United States Postal Service and universities are running their own instances of the Open Build Service. Some of these are available in our list of Open Build Service installations. The release plan is outlined in the Roadmap and gets created from the list of proposed features and Concepts. 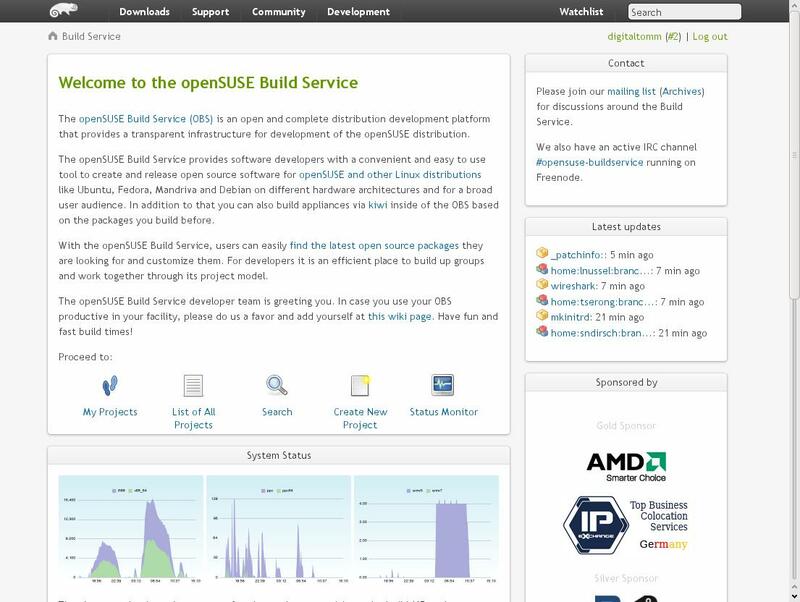 The source and documentation of the Open Build Service and its tools are hosted inside the Open Build Service Project at github.com. Notification messages for every commit are sent to the obs-commits mailinglist. The source code is covered by an extensive test-suite, for which the results and graphs can be found at the OBS Jenkins instance, and notification mails are sent to the obs-tests mailinglist. Please refer to the developer documentation for details. Here is a list of official and non official OBS components and tools. As with most open source projects, please start to write patches or a concept what you plan to develop. Github offers a nice feature to clone from the OBS project, change the code and submitting it back into the base project. There are some smaller projects (Junior Jobs) which are a good start for discovering the code and joining the development team. At the moment we are doing community support via irc and mailinglists. OBS developers can also be met on popular open source events. If you would like to receive commercial support, please contact Andreas Jaeger to discuss options. Before you start using OBS, you'll probably want to learn the basics of RPM packaging. Fedora offers a good howto that we suggest beginner packagers review before diving into OBS. The OBS is documented in this wiki. Packagers should start reading the tutorial and the cross distribution package how to. Some general hints can be found on the FAQ and Tips & Tricks pages. There are various presentations available. An important piece is the documentation for the API. The API is a simple and generic interface to work with the Open Build Service. You may use it to integrate your tools to submit code updates, check the current state of your projects or doing something very different and cool. A cheat sheet for osc is available as well and a reference guide and a best practice guide are being in development (help welcome!). This page was last modified on 3 June 2015, at 12:16. This page has been accessed 550,621 times.